If you missed the first four posts about My Crazy Road Trip, click on the link HERE to get caught up. When we last left off, Mom and I had just escaped the Salt Flat People. 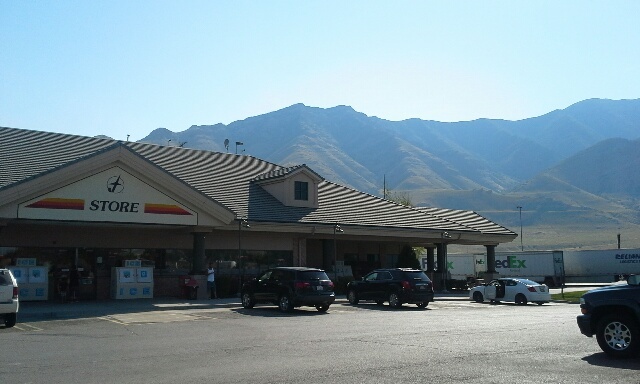 After a good night of rest (three hours) we headed across the street to this lovely Flying J gas station. After we gased up for our trip and grabbed snacks, we're ready to hit the road again. Only Mom's jeep wouldn't start. The battery was DEAD. And Mom's jumper cables were at the bottom of a pile of boxes in the back of her jeep. It's at times like these when you realize how nice people can be. We got a lot of help. One man told us it was the alternator. He offered to call a tow truck for us. Another man thought the battery cables had loosened during the drive. Turned out, he was right. Only we didn't know it at the time. He tightened the cable for us. Unfortunately, the battery still died right afterwards, leading us to believe it really was the alternator. Mom called USAA road service, and they dispatched a tow truck. Meanwhile, we left the jeep connected to the Uhaul and charged it up while we waited. By the time the tow truck driver arrived an hour later, the battery was already fully charged. YAY! He checked it over for us. Everything was okay! He then gave us the go ahead. Thank goodness this didn't happen in the middle of the desert. This side bar stole most of the morning. 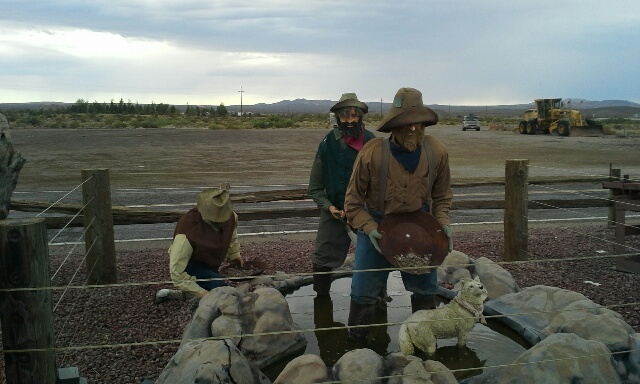 We didn't make it to Las Vegas as planned. Shoot, we didn't even try. We got really close and found a hotel at 4 p.m. We woke up at 1 a.m. and hit the road by 3 a.m. Las Vegas came and went at six a.m. The sun was just coming up, so the town was still lit up. Traffic was minimal. We crossed the Valley of Fire before it got hot enough to burn. Next stop, San Diego, where I lost my mom on I-15. I pulled off onto the I-215, but I didn't notice she wasn't behind me. We ended up making the last hour of the drive solo. But we made it. 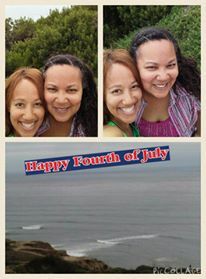 I got to spend the 4th of July with my mom (who refused to be in a picture posted online) and my sister at the ocean. It was a glorious. Vinnie and Angie at the beach. What I learned from this trip is that I'm stronger than I thought. If I had to, I know I could travel across the country alone. No problem. Having the trip veer off from the plan made this an adventure I'll never forget. Want to watch the mining video. Click here for my Facebook page.